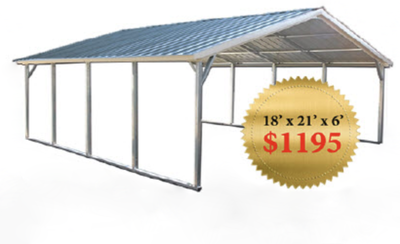 Quality, Texas Built Metal Buildings, With Prices You Can Afford, And People You Can Trust! Our products are available in Meridian and all of Central Texas. Personal and recreational auto carports, steel barns and RV covers are among the many items that people rely on to protect their valuables and most treasured possessions. Possessions and investments are an essential portion of the livelihood of most people, and quality forms of protection for these investments is necessary. Protection against inclement weather, hail and the harsh sun is imperative to ensuring the longevity and value retention of recreational vehicles and personal belongings. We provide superior protection for customers across the state of Texas. 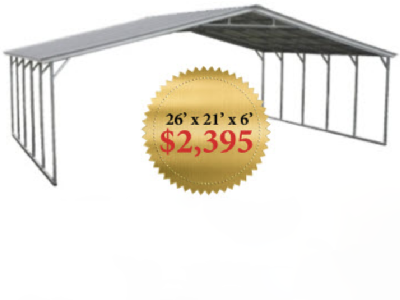 As a leading supplier of metal barns, carports, RV covers, metal garages and other metal buildings for protection or storage, we have extensive knowledge of and work diligently to meet our customers demands. For your convenience, we offer both wholesale and retail sales and you can purchase through one of our distributors too. We know the importance of protecting your valuables and assets at home or in business and we've paved the way for consumers to find the right products that over deliver. Our customer service standards are the highest in the industry and we believe in treating all of our customers like they are our only customer. We are dedicated to delivering an excellent and delightful experience from the initial consultation to post-delivery and installation. Our commitment to our customer extends far beyond the point of sale, to ensure that you receive the ver best quality of service and customer care. 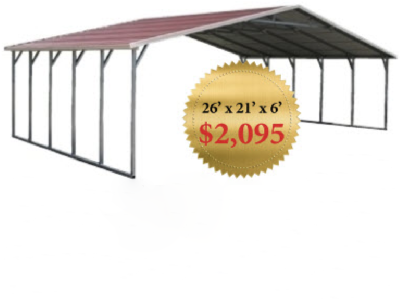 Modern steel garages, steel carports, steel barns and steel RV covers are the best mode of protection from weather and other hazardous conditions of the environment including acidic rain, chemicals and more. In addition, to protecting valuables, livestock can be protected with the use of our technologically advanced metal barns. Today, many people seek contemporary measures of protection for their goods, valuables, and investments. The days of using wood are fading due to the lasting durability, low maintainence and efficient cost of metal storage buildings. 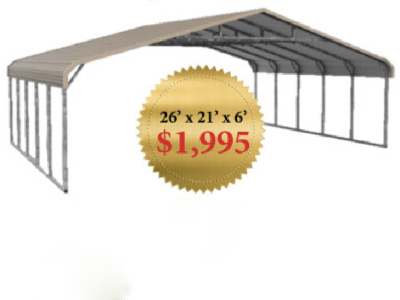 We offer elite metal carports with a variety of measurements and designs to choose from. We understand that customers have varying needs for us to accommodate, and we strive to deliver options to satisfy all of those needs. Each one of our products are manufactured with the highest quality materials available and they can be customized to meet your specifications. 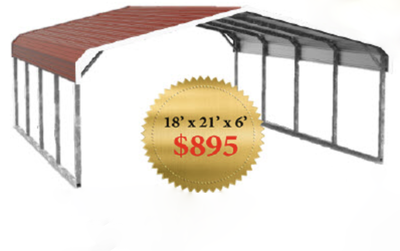 Carports are a fantastic and cost effective solution to protecting your vehicles from the elements and damaging UV rays of the sun. When purchasing from us you completely eliminate the need to consult and hire contractors to assemble the product on your property. We make it as simple as deciding how much space you need to cover, what size and material you prefer, and our team of experienced metal building constructors will erect your metal building quickly and perfectly. Many consumers don’t realize the number of options they have for protection of their cars, boats, RV's and other items. There are a wide variety of color choices available, and customization options that most homeowners and businesses find accommodating to their needs and desires. Consider the color of the home or business property of which the carport, steel building or metal barn will be placed. Choosing a building style and color that will complement the home or business with which it shares a space will maintain and aesthetic appeal and offer value to the property. For properties without a garage, these steel garages are the perfect option. In fact, there are a few advantages that the metal garage structure has over a traditional wooden building. Once the consideration or decision to purchase arrives, consider the following benefits of owning a metal garage. The option to save money long term without sacrificing quality is what these metal garages present as an advantage. They are constructed of metal, which is an insect and weather resistant material that will last for many decades. The traditional wooden garage can cost significantly more than the metal or steel building. Erector set type assembly makes this contemporary option more feasible for many consumers. In addition, on site assembly is included in the price of most buildings! 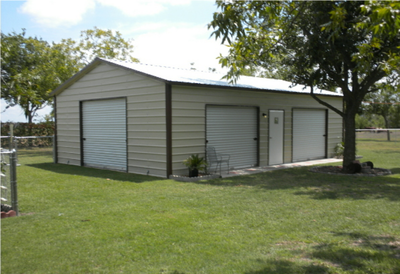 The flexibility and customizable capabilities make our metal garages more popular than any other type. They are easy to have installed and can be placed on almost any level surface on your property. 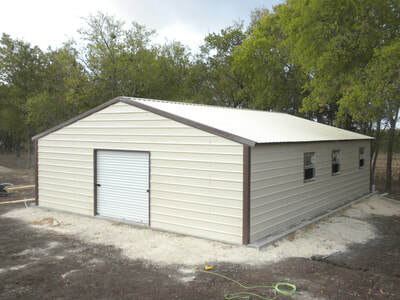 These metal buildings can also be easily attached to existing structures on the property. The convenience and cost-savings are substantial, and regarding future customized add-ons that customers may wish to implement, they can be done at any time. Customizing the traditional wooden garage could cost more and require contracting professionals to complete the task, which significantly adds to the cost. 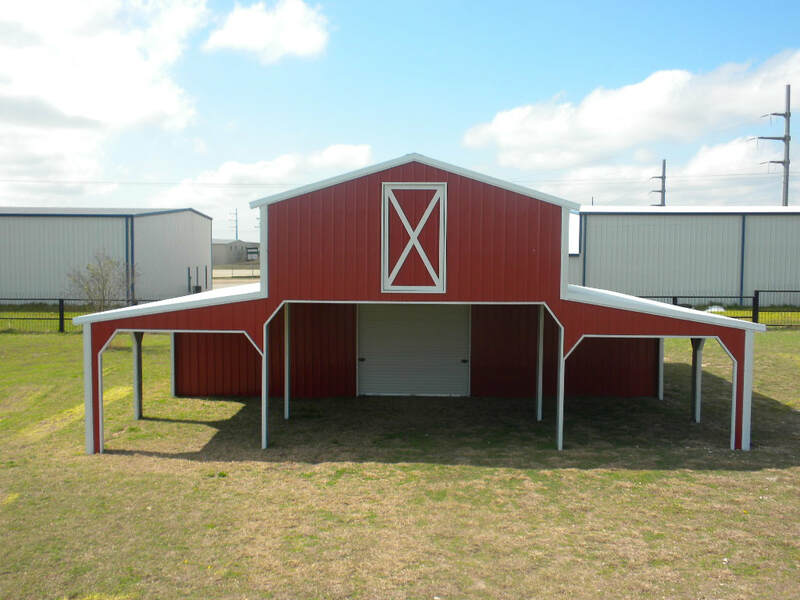 Metal garages, metal horse barns, metal RV covers, and steel buildings are manufactured to be resistant to rust, with baked on siliconized paint and two different gauges of steel to enhance it's strength. Modern steel manufacturing techniques produce longer lasting materials and modern paints not only make them look good, but virtually eliminate maintenance. Wood structures are subject to warping, cracking, rotting and mold. Another destructive culprit of wooden garages are termites or other insects that may feed on or cause infestation that destroys the wood. As your search for a quality and accommodating building process, remember that steel buildings offer a variety of advantages in safety, value, convenience, as well as versatility, to which wooden structures have no comparison. 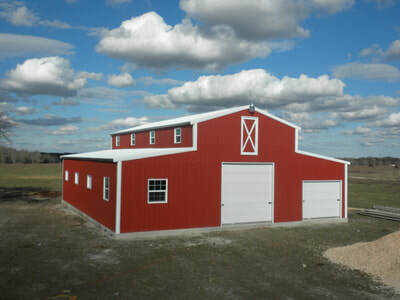 Metal barns offer a resourcefulness and convenience, unparalleled by any traditional barn. Our products are constructed with superior quality U.S. steel and offer a superior standard of strength, flexibility and a contemporary appearance. The added convenience of quick assembly and minor maintenance makes this unit ideal for the storage and protection of farm equipment, agricultural machinery, livestock, hay and more. Your animals and equipment are safe from the elements and other environmental dangers. Protect your investment with covers that shield and protect your RV. Extensive exposure to the sun, storms, hail, rain, bird droppings and more, can cause wear and tear on your recreational vehicle. Why Steel And Not A Portable Building? Portable buildings have been a popular choice vs. paying the storage space companies each month and are much more common today than ever. The advantages presented by this type of building structure today make ownership, upkeep, and convenience an easy adjustment and a major purchase motivation for many. The drawback is size, because you can only build them wide enough to travel down a road for delivery. Space is limited to the width and length restrictions. Our metal structures offer you the abilty to have multiple configurations, varied spaces, fully enclosed, partially enclosed and completely open. Workshops, craft rooms, storage spaces, warehouses, garages, carports, barns and more are all made possible with the help of steel structures. The longevity and ability to withstand strong wind and heavy downpours of rain make these units the obvious choice. Durability and strength are the primary advantages. They are manufactured to house and secure valuable items such as tools, lawn equipment, gardening essentials and more. The attractiveness factor is not to be overlooked either. Long gone are the days where the only color choices available were various shades of dull grey, white or fake aluminum paint. Today the color variety is extensive, which makes it easy to choose the perfect color of your choice. Enhanced color selections are a great addition to any landscaped property, as it contributes to the overall beauty of the space or property. Even if your general need is to have additional storage space, having that storage space while looking good is even better. Regardless of whether your portable storage building is on a residential or a commercial property, aesthetics are still important to most of us. 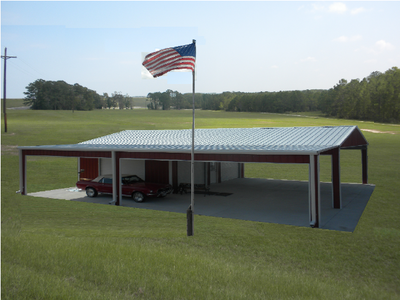 Our metal carports, metal garages, metal barns, metal RV covers and triple wide metal buildings are ideal solutions for most personal and business needs. 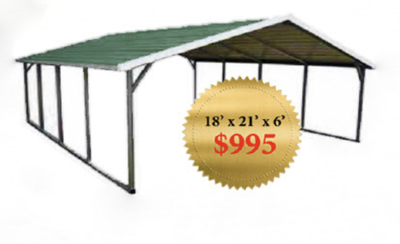 Sizes vary, which make it easy to fit into a variety of garden, lawn or business spaces. The ability to customize your portable storage building makes them a favorite over attached or permanent storage structures. It is more valuable to have variable configurations than to be forced to choose from premanufactured portable storage sheds that offer no flexibility in design or size. Our ultimate goal is to deliver a high quality and extreme satisfaction in all the steel buildings we manufacture. We understand that the requirements of our customers are rapidly changing, and our products are designed to accommodate those changes. 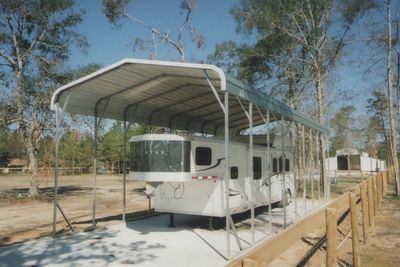 The demand for these products has increased dramatically over the years, as metal barns, metal carports and metal RV covers have become ideal for both private and business use. The extensive number of uses for metal structures is growing each day and include simple storage space, a workshop, garage, livestock housing, warehouse space, commercial business space and more. Metal buildings can be erected on your site quickly so that you can be up and running in no time. Steel building assemblies can be customized, which makes it easy to adjust them to accommodate changing needs or to reflect desired styles. Our company offers many different options to accommodate almost every need imaginable. We value and understand the extensive convenience that metal buildings offer our customers. We have a unique selection of small to large units for sale as well everything in between. Our experts are ready to answer your questions and explain the various metal buildings that we offer, their options and how the installation works. We provide service to consumers near and far with options to make their metal building needs affordable and realistic in design, delivery and construction. Consumers should be presented with products and services they can use and appreciate. Metal buildings, carports, metal garages, RV carports, and metal barns offer flexible options that no longer place limitations on buildings for both private and commercial projects. Contemporary models complement the existing structures that most homeowners and business owners prefer. We also offer very competitive financing through our financial partner with rates and terms that fit most needs.